3 kinds of Thai sweets which I recommend. There are lots of eating stands in many places as walking the town of Bangkok. It is delicious not to mention the Thai foods, and it is one of the pleasure of the trip to eat a local sweets. 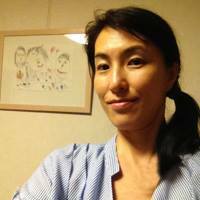 I will introduce the delicious sweets in this trip. Khanom khrok is coconut-rice pancakes. Khanom means sweets in Thai. This mixed wheat flour, coconut milk, sugar, corn, leeks and roast in a pan. It sounds easy ! I might make at home. 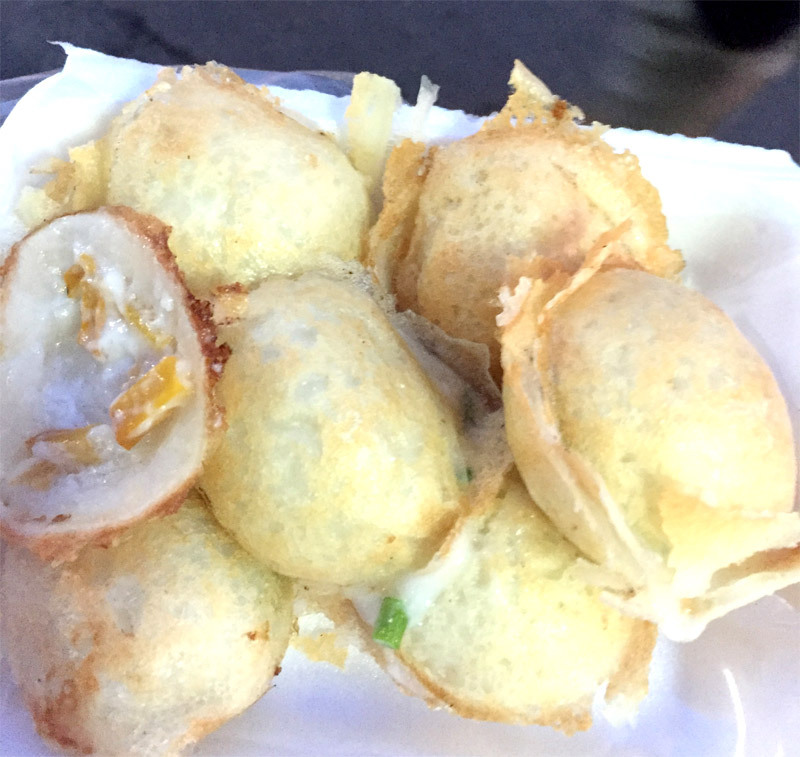 The takoyaki does it into a round ball form neatly, but Khanom khrok bake only one side and just picks them up on the dish. As it is eaten willingly if hungry a little, it is popular with the school children and the female office workers. 20 baht (around 70 yen). That is cheap! Khanom khrok or coconut-rice pancakes (Thai: ขนมครก, pronounced [kʰā.nǒm kʰrók]) are one of the ancient Thaidesserts. They are prepared by mixing rice flour, sugar, and coconut milk to form a dough. Usually, khanom khrok is composed of two batters, one salty and one sweet, both of which are cooked in a heating mantle–a hot indented frying pan. After heating, khanom khrok will be picked out of the mantle and the two half-circular doughs formed into a circular shape. When I went out to the street, young lady seller this sweets. 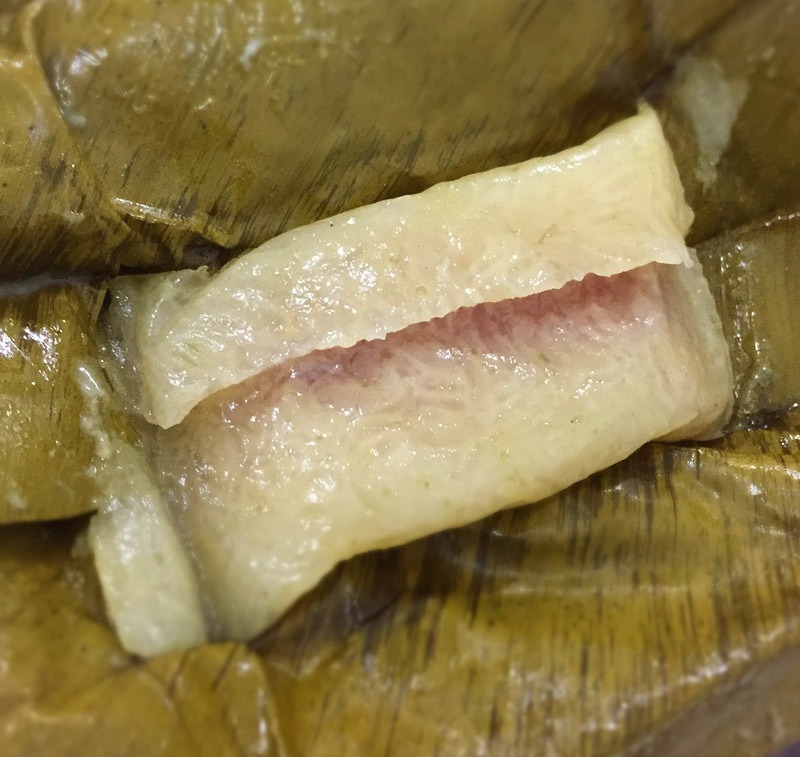 This is the simple cake made from wrapped glutinous rice with a banana leaf and steamed. Some purple and a yellow thing are inside. Delicious!Probably it was boiled beans,maybe. Khao means rice, niaow means sticky in Thai. 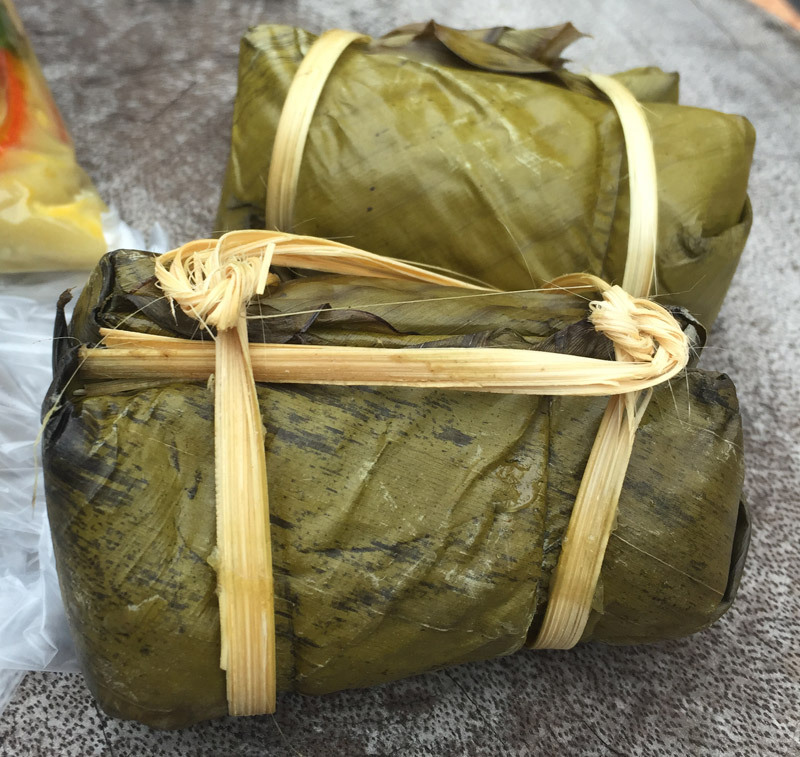 The cake wrapped with the leaf of the banana is called “khao niaow muang”. I found retort-packed food at the grocery store. So I bought a lot and gave my friends after going back to Japan. It was good, as I ate at home,too. Before eating, it should be heated using a microwave oven. 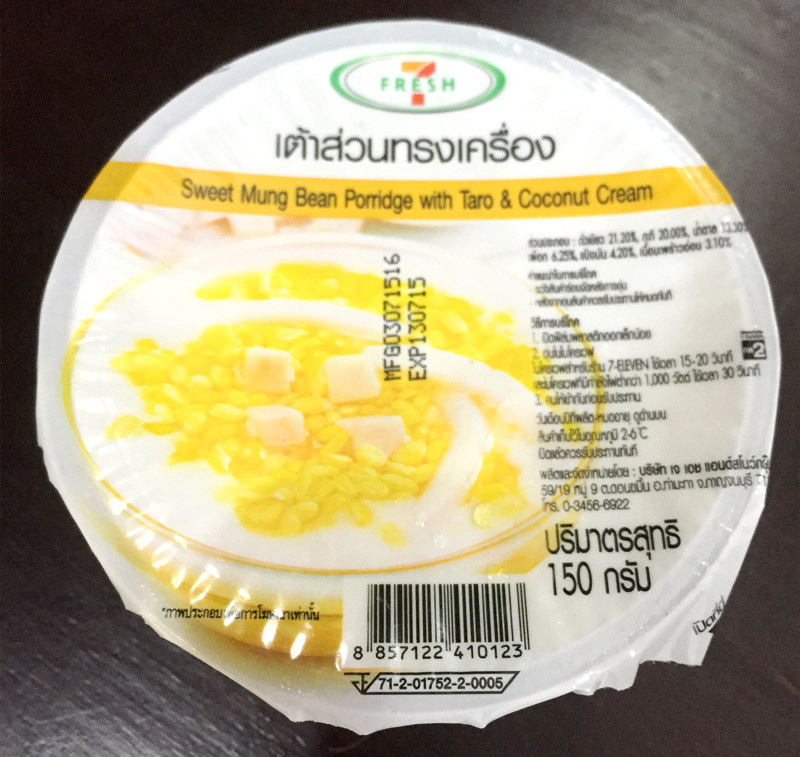 “Sweet Mung Bean Porridge with Taro & Coconut Cream” is like Yogurt. And then I found this one at Seven-Eleven. The rice porridge of the Phaseolus radiatus seems to be popular breakfast in Malaysia and Indonesia, but this is a sweet cake. Because it is cooled with a refrigerator, it is eaten for a sense such as the yogurt.